WILD WASTE Nitrogen from the guano of seabirds, such as this red-footed booby chick, leaches into coral ecosystems and helps them stay robust. When invasive rats chow down on island seabirds, coral reefs suffer. Researchers studied islands with and without the rodents in the Chagos Archipelago in the Indian Ocean. On rat-free isles, there were on average 1,243 birds per hectare compared with about two birds per hectare on rat-infested islands, the team found. And these rodentless islands had healthier coral reef ecosystems. The secret: Bird poop, naturally rich in nitrogen, washes into the ocean and helps keep reefs productive, the scientists report in the July 12 Nature. “We’re essentially linking three ecosystems in this study,” says study coauthor Nick Graham, an ecologist at Lancaster University in England. The rats affect the seabirds, which affect the reefs. 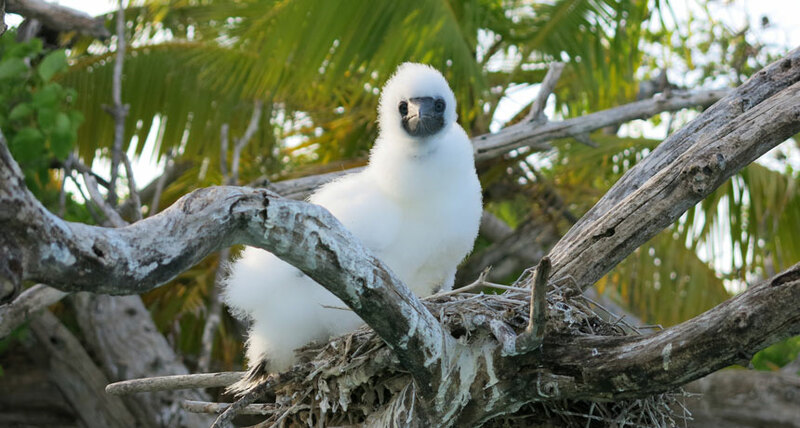 Introduced by humans to the Chagos Archipelago in the late 18th century, rats have since devastated native seabird populations, including red-footed boobies and terns. The rodents will eat seabird eggs, chicks and even the brains of adult birds, says Holly Jones, a restoration ecologist at Northern Illinois University in DeKalb who was not involved in the study. Rats are a major problem, Jones says, because seabirds are “ecosystem engineers.” When they’re gone, the environment on land and in the water changes dramatically. Bird poop, or guano, is rich in certain heavy nitrogen isotopes — different forms of the element with the same amount of protons but varying numbers of neutrons — which come from the animals’ diet. Graham and his colleagues tested for these isotopes on 12 islands, six with rat infestations and six that had no rats, and in nearby coral reefs. Compared with rat-infested islands, the team found much more of the heavy nitrogen in the soil of rat-free islands, where bird populations still thrived, and in the algae, sponges and fish in reefs that surrounded those islands. Bird guano is known to leach into the sea in rainwater or lapping waves, but its effects on reefs has been unclear. The researchers now suspect the reefs around rat-free islands are healthier in part because nitrogen can act as a fertilizer for ocean plants and algae. More algae grow, leading to more fish grazing on the reefs and helping clear out dead corals, essential processes for a healthy reef. The fish that lived near reefs with more nitrogen also grew larger and faster, the scientists showed. In addition to these indirect effects on reefs, nitrogen may also directly help the corals, says David Gillikin, a biogeochemist at Union College in Schenectady, N.Y., who was not involved in the study. Between 15 and 50 percent of nitrogen found in corals comes directly from seabird guano, he says.